I’ve recently discovered Jon Bon Jovi and though I know his band’s songs, it’s only now I actually paid attention to the person behind the rockstar image. And man, am I surprised. I initially found it hard to reconcile the rockstar image I had of him to this person who hails from New Jersey and has made good not only as an entertainer but as a role model. Aside from being married to the same woman for 26 years in an industry where divorce and infidelity are so common that they no longer shock the world, he has also made himself socially relevant by devoting his energy to charity. And what I love the most about him is how he is able to separate his work as an entertainer from the person that he is. Perhaps that has helped keep him sane all these years. Had it been any lesser and weaker human being, we might have seen someone who caters to our stereotype of rockstars. Not to say that he lives a perfect life. His daughter had a drug overdose a few years back though something has to be said on how it was him she called when it happened. But just as JBJ himself said, he’s not the only one who has gone against “cliche”. There’s also Bono. For sure, JBJ and Bono belong to a class of their own in the league of rock stars. And because of that, and more than their music, they really rock. And on the occasion of Chinese Valentine’s Day a few days ago, he recorded The Moon Represents My Heart for his fans (which is actually one of the reasons why I’m posting on him because it amused me so much). 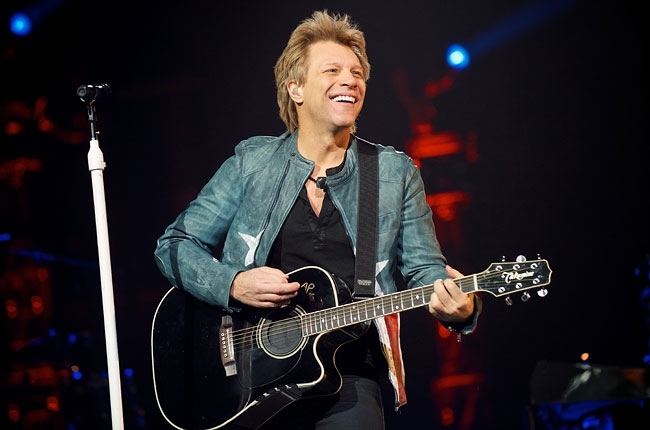 Bon Jovi is more than three decades old as a band and while they are facing a crisis with Richie Sambora leaving the group, they have served as an inspiration to many musicians. And it takes years and lots of hard work to accomplish what he and the rockstars of his generation have accomplished. And my fave Bon Jovi songs? Well, aside from the “cliche” It’s My Life, Livin’ On A Prayer and You Give Love a Bad Name, my favorite would have to be Who Says You Can’t Go Home, simply because it shows the band almost three decades later and still rocking it out and remains relevant, music-wise and civic-wise. I will give the album a listen. thanks for the recommendation! oh and you are watching Bon Jovi? SO LUCKY YOU!!!! !